The mission of the Institute for Quantum Studies is to provide a worldwide focal point for students, researchers, governments, and industries to collaborate on advanced studies of quantum mechanics, including: quantum foundations, quantum information science, quantum computing and technology, and applications thereof to other fields. In addition, we offer support to new fields evolving from these cooperative advances in mathematics, as well as social, biological, computational, and physical sciences. The Institute for Quantum Studies strives to communicate both the relevance, and importance, of quantum mechanics to an extended audience through community focused outreach. We hope to address the diverse interests of the general public by making conceptually rich science more accessible to others. + - Why study quantum mechanics? Quantum physics is the most successful scientific theory in history, and is crucial for the advances not only driving our economy, but also propelling us towards new possibilities. Early in the twentieth century, big scientific theories governing the microscopic world of atoms would lead to many discoveries that, today, account for over half of the US Gross National Product (discoveries such as computers, lasers, etc). America’s future prosperity and economic security may rely in part on the exotic properties of some of the smallest particles in nature to accomplish feats in physics, information science, and mathematics that are impossible with today's technology. Quantum information science seeks to use the fundamental properties of nature at very small scales to build technologies that... offer potential solutions to issues looming on the horizon of technology development, including the limits of Moore's Law on the microelectronics industry. Quantum Studies sets the scientific standard for the future by redefining what’s possible now. 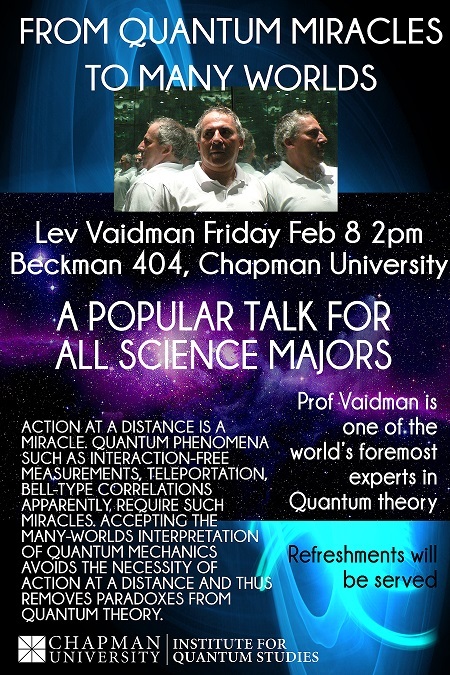 Dr. Lev Vaidman presents "From Quantum Miracles to Many Worlds" on Friday, February 8th @ 2PM in 404 Beckman Hall.